Little Kwara Camp is a luxury safari lodge situated on permanent waters in the heart of the Okavango. This camp offers you the complete Okavango Delta experience. 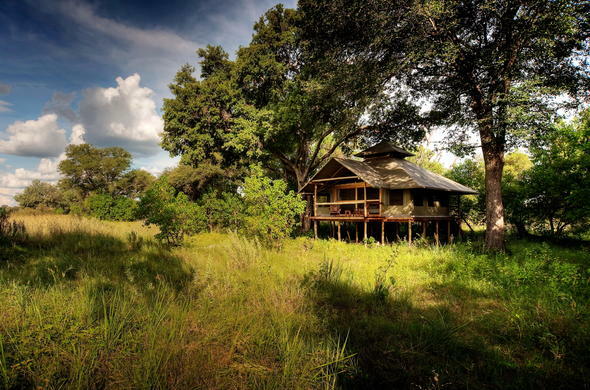 Little Kwara Camp is an intimate safari lodge in Okavango Delta. The camp is situated on the edge of permanent waters of the Delta in the game rich private Kwara concession bordering on the Moremi Game Reserve in the northern Okavango Delta. This exclusive camp has just five tented suites with well-appointed en-suite bathrooms. The central areas of the camp are open and spacious. The decor of the camp creates a colonial feel evoking the ambiance of safaris from a bygone era. This is an ideal camp for exclusive use by small groups and families. As it is situated on the permanent waters of the Delta, Little Kwara offers year round wet and dry safari activities. Head out to explore the twisting channels of the Delta in traditional boats called Mekoros, while seeing fantastic birdlife and maybe even an Elephant. Enjoy sunset cruises on the double deck boat. Discover the Delta on island walks. Back on solid ground you can see the regions amazing wildlife on morning and evening game drives, the latter which allow you to see the many nocturnally active animals of the region. Each of the thatched suites has its own private viewing deck that is the perfect spot to relax with a good book and wait and see what wildlife comes by. Explore the channels of the Okavango in traditional style canoes called Mekoros. These boats used to be carved out of giant trees, but to conserve the trees – plastic ones are generally used these days.